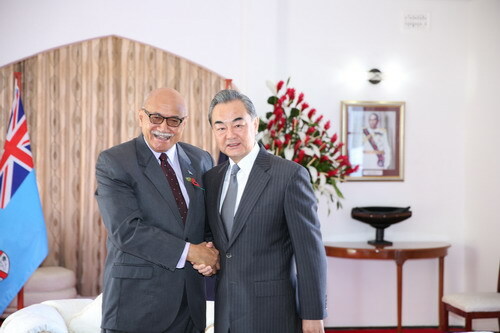 On October 30 local time, State Councilor and Foreign Minister Wang Yi met in Suva with President George Konrote of Fiji. George Konrote asked Wang Yi to convey his warm greetings to President Xi Jinping. George Konrote expressed that China is a major country with tremendous international influence and time-honored civilization, and President Xi Jinping is a great leader with strategic foresight and his works on state governance and administration are very helpful to Fiji. Fiji highly cherishes its strategic partnership with China. In recent years, Fiji-China relations have enjoyed constant development. In particular, the great success of President Xi Jinping's state visit to Fiji in 2014 boosted the rapid development of bilateral relations. China has offered Fiji much aid in fields including bridge construction, infrastructure, agriculture and education, bringing tangible benefits to the people of Fiji, for which the Fijian side is deeply grateful. The Fijian side firmly adheres to the one-China policy, and hopes to learn from China's successful development concept and experience, so as to further strengthen mutually beneficial cooperation between the two countries. Wang Yi conveyed President Xi Jinping's greetings to George Konrote, and expressed that China is a good friend and good partner of Fiji. China and Fiji have always respected, understood, and supported each other though they are different in size. It is hoped that this fine tradition will continue to be consolidated and carried forward. China is still a developing country, and has always been standing with the vast number of developing countries and small and medium-sized countries. The Chinese side attaches great importance to Fiji's influence in the Pacific island countries. Four years ago, President Xi Jinping paid a successful state visit to Fiji, during which the two sides established strategic partnership featuring mutual respect and common development, promoting China-Fiji relations to embark on a fast lane. It shows that the Chinese side is willing to view the development of the relations with Fiji from a strategic height and long-term perspective. China's support and assistance to Fiji do not attach any political conditions, seek any private interests, or target any third parties. The Chinese side is willing to exchange experience in state governance and administration, strengthen mutually beneficial cooperation, assist Fiji in its development and revitalization, and jointly safeguard the legitimate rights and interests of developing countries with the Fijian side.